Experience Japan’s traditional performing arts! Enjoy Japanese dance, street performances, the sounds of traditional instruments, and more at the Resident Cultural Festival “A Gathering of Japanese Pastimes” stage. 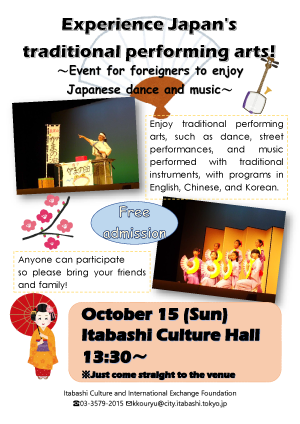 Enjoy traditional performing arts, which are often inaccessible, with programs in English, Chinese, and Korean. The event is packed with activities! You can even participate in group dance sessions. Anyone can participate so please bring your friends and family! Just come straight to the venue. Programs will be distributed at the reception. Bowl and make friends with people from around the world. Stick around for tea after!